Bring me a rose cut from the garden and my heart will most certainly skip a beat. Single- or multipetalled, cream, blush, apricot, or pink—I’m not picky. The heady scents of myrrh, almond, and honey fill my soul with joy. I have Technicolor dreams of climbers clambering over walls and floribundas billowing in borders laced with perennials. Yet, I confess: I was once afraid of roses. Even as a degreed horticulturist and veteran gardening editor, I was scared to grow one of the most beautiful, reliable, and drought-tolerant blooming shrubs around. Why? Because roses are fickle and require an arsenal of chemicals to look good, right? Wrong. My perception changed when I was educated by Paul Zimmerman, now coordinator of the Biltmore International Rose Trials, which began in 2011. The purpose of these trials is to take the anxiety out of growing roses by selecting only the best new varieties that thrive under organic and sustainable conditions. Judged by a permanent jury, the plants are scrutinized for two years and rated on overall health, appearance, vigor, fragrance, and bloom. At the final evaluation, a distinguished international jury weighs in. Their scores are added to the permanent jury’s, and the winners are announced each May. Anyone who breeds roses can enter these trials. The lack of an entry fee and the fact that smaller plants are accepted means new breeders can compete with the pros and gain recognition for their efforts. Roses that do well will thrive in gardens across Western North Carolina and beyond, giving confidence to novice gardeners and those who opt for earth-kind practices. “It’s very exciting because up to now, roses were rarely tested in this area,” says Zimmerman. Most major producers simply felt roses would not do well in the South—something both Zimmerman and former Biltmore horticulturist and rosarian Lucas Jack know is not true. The trials found a home at Biltmore when Zimmerman approached the estate about hosting them. Until then, the only other International Rose Trials in North America were in Southern California at Rose Hill. “This site, the knowledgeable staff, and Biltmore’s commitment to excellence and sustainable gardening made it a perfect match,” says Zimmerman. The 2015 Rose Trials take place May 29 & 30, with judging on May 30. Biltmore offers a special ticket package that includes a reception in the Rose Garden, entry to the competition during judging, a garden tour, and access to the awards presentation and luncheon. Anyone can visit the Rose Garden with a general ticket onto the estate; to see the roses at their peak, late May and early June is the best time to go. For more call (866) 851-4661, or visit www.biltmore.com. Select the right varieties: Consult the Biltmore trials, local rose societies, public gardens (provided they don’t spray), and savvy garden centers to find out what thrives locally. Think outside the hole: Prep the entire bed. Spread two to four inches of compost over the area, lightly till, and then add beneficial microbes like mycorrhiza to break down organic matter. Plant at the right depth: Bury the bud union (the knot where the canes come out) two to three inches below the soil level, not above the ground. Mulch, feed, and water: Mulch after planting and pruning. Feed with an organic time-release fertilizer in early spring and late summer. Water deeply and infrequently. For more information, check out the book Everyday Roses by Paul Zimmerman. 1. 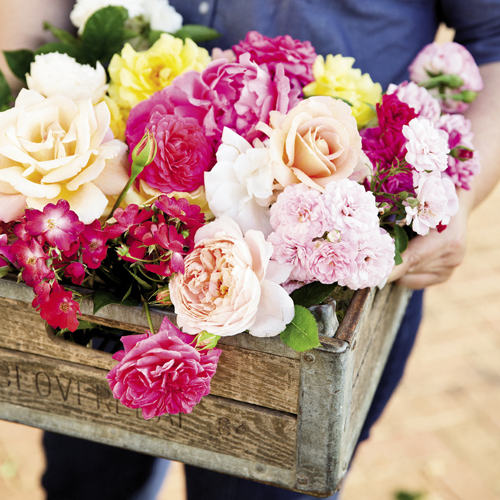 Cut roses in the morning and immediately place in a bucket of water prior to arranging. 2. Fill vase with water and then use florist tape to create a one-inch grid over the mouth. 4. Fill in-between with smaller blooms. Repeat, working towards the center. 5. Finish by tucking in buds or delicate filler. Check for holes and add additional roses if needed.